Topic: How do you know that someone has understood you correctly without asking each time, “Do you understand?” (and students are often programmed to respond “yes” even when they don’t). Teaching listening may seem ambiguous, as there are actually a number of principles, processes, reasons and activities. In the endeavor to become better communicators, we tend to neglect the other half of the battle – listening. 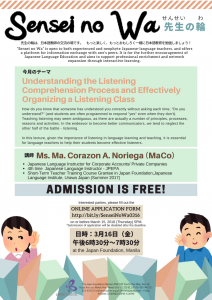 In this lecture, given the importance of listening in language learning and teaching, it is essential for language teachers to help their students become effective listeners. Time 6:30 p.m. – 7:30 p.m. Interested parties, please fill out the ONLINE APPLICATION FORM http://bit.ly/SenseiNoWa0316 on or before March 15, 2018 (Thursday) 5PM. * Submission of application will be disabled after the deadline.